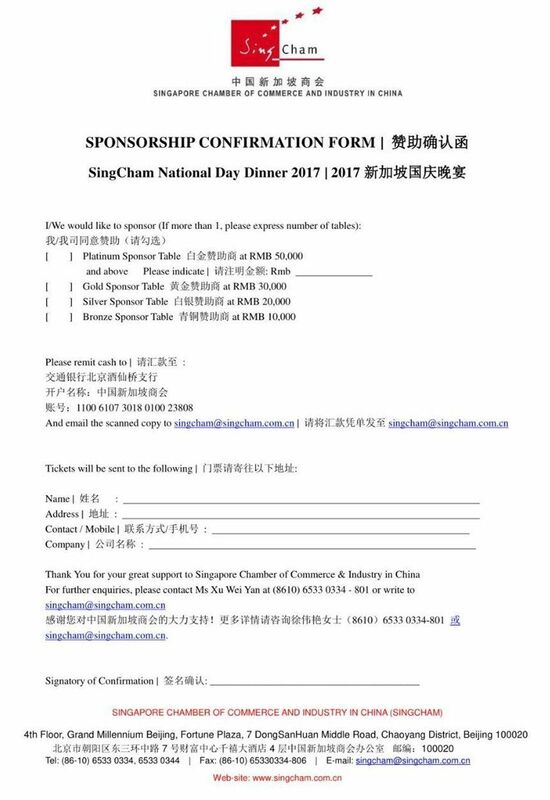 We are pleased to announce that SingCham will be celebrating Singapore's 52nd National Day and SingCham 15th Anniversary with a grand dinner filled with performances, fun and games at Grand Millennium Hotel Beijing on 5th Aug 2017. The occasion will also be graced by our Guest of Honour the Ambassador of Singapore Mr. Stanley Loh. As always, this will be an excellent networking opportunity with more than 500 distinguished guests and senior government officials. Over the years, many generous members have contributed to the success of our national day celebrations and this year we welcome your company to consider giving its unyielding support by being one of our Platinum, Gold, Silver or Bronze table sponsor. Table sponsorships offers you the ultimate in recognition amongst our members and friends during the night of the dinner and beyond. 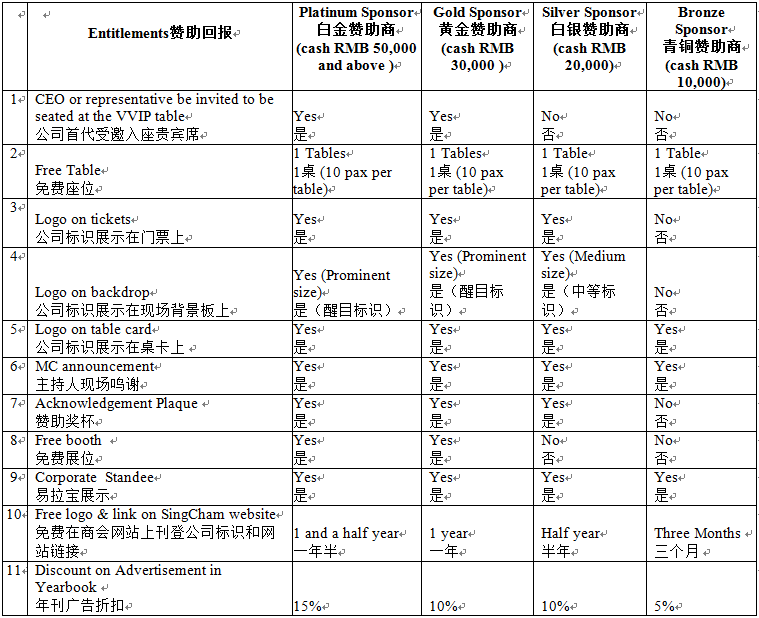 Benefits of being sponsors can be gleaned from our Sponsorship Options chart below. Other than being table sponsors, many members, friends, hotels and retail outlets have offered products and services as lucky draw prizes for this special occasion. We hope that this year your company will chip in with your products/services as lucky draw prizes/door gift for this grand dinner. For this, your company will not only be contributing in making the evening a success your company will also be well publicized through acknowledgments during the night. This will be an excellent way to promote your corporate image and products. We look forward to your generous support as every sponsorship will contribute towards the event’s success. Kindly inform us of your decision by replying with the attached completed sponsor confirmation form before 10th July 2017. Looking forward to your favourable reply. Thank you!